This weeks mainstream media coverage in the UK of the sale of the bankrupt bailed out Northern Rock to Virgin Money for approx £1 billion against a £1.4 billion cost to the tax payer for a net loss of approx £400million as illustrated by the Daily Mail and the BBC's Robertt Preston telling us that the tax payer has got a good deal is WRONG. Taxpayers lost at least £400million yesterday with the sale of bailed-out Northern Rock. What the mainstream propaganda is overlooking are the bad debts amounting to approx £45 billion that have been removed from Northern Rock and placed under government agency management or in other words are the liabilities of tax payers. The actual losses that the tax payer is ultimately staring at will amount to between £18 and £25billion, or about 60 TIMES the official loss of £400 million. Northern Rock represents a microcosm of the state of the UK and global banking system in that the bankrupt banks that were not allowed to go bankrupt but bailed out at unlimited liability to the tax payers are now bankrupting governments to which the only response governments have is to print debt at artificially low interest rates as a consequence of monetization of debt i.e. printing money to buy government debt that has been accrued as a consequence of bailing out the bankrupt banking sector. More on this in my next in-depth analysis of the Inflation mega-trend, to get this in your email in box ensure you are subscribed to my always free newsletter. The current outlook is still valid for stock market? Because I am seeing lot of calls for crash from SPX 1200 to 1000/900-500 level, in next 2-6 weeks from now. WE just had 20% correction and now we are on our way to next new high in the normal bull market according to inflation mega trend based on your last update. Can you please comment on this for quick reply as I wait eagerly for your next in-depth update. We are witnessing the decline of the West. I tried to warn people not to get into the markets despite claims of "new bull highs" when technically this did NOT fit. Governments always go after "other people's money" in their last desperate attempts to hold on to power and the status quo. This is why we are seeing our freedoms and democracy being hindered. I suppose the question must be asked whether you want to live in this kind of ever increasing fascist state? Good luck with your Sheffield house purchase Nadeem. I personally would be moving away from this desperate country. Look at how our wealth has been deliberately eroded through the currency exchange rate markets (QE). Expect more of this until the people of Britain are cornered and cannot get out. Perhaps, then we will hear the proverbial "pips squeak". as the middle classes finally wake up to their reality - enforced enslavement by the banking elite. When market interest rates do rise, the misery will increase further. When ? Well as the debt contagion increasingly spreads to core eurozone then that will end the German Bunds bull run, prompting the ECB to print money and monetize all EU debt. 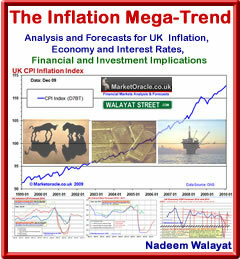 Watch for my next in-depth article on UK inflation mega-trend. But, at the end of the day, the future is very bright, we are on a parabolic curve of technological developement, the next 20years will see more advances than the last 200 ! Genetics, we have not even begun ! Imagine bacteria that turns waste into food or fuel ! Thats where we are heading! Hi Nadeem, how does the failed German bond sale overnight affect your analysis. To my mind, if the Germans can't raise cash Europe is gone, no matter how much money printing they do, because no one will have faith in this cash they will be throwing around. I think we are heading down next year, but maybe a Santa Claus rally before then. The markets are waking up to the fact that Germany is offering 2% against 3% inflation. The same holds true or is worse for the rest. I need to complete my article and post it cos events are happening that I am anticipating but have not posted for a few weeks. In which respect there are mega-profits brewing in shorting the bond markets, thats Japan, UK, Germany and eventually the US. The UK is not a safe haven, neither is Japan or the US, the UK interest rates should be about 6%, thats were they eventually will be (10 year gilts) and spike far higher at a rate we cannot even imagine today. I hold some UK and international inflation-linked bonds; would you suggest I sold them?